GRPL 33, Box 13, Folder 58, c. 1960. Front of building was cream with red trim. The theater and the adjoining Fulton Fruit Market at the corner of Fulton and Straight were torn down soon after this photo was taken. 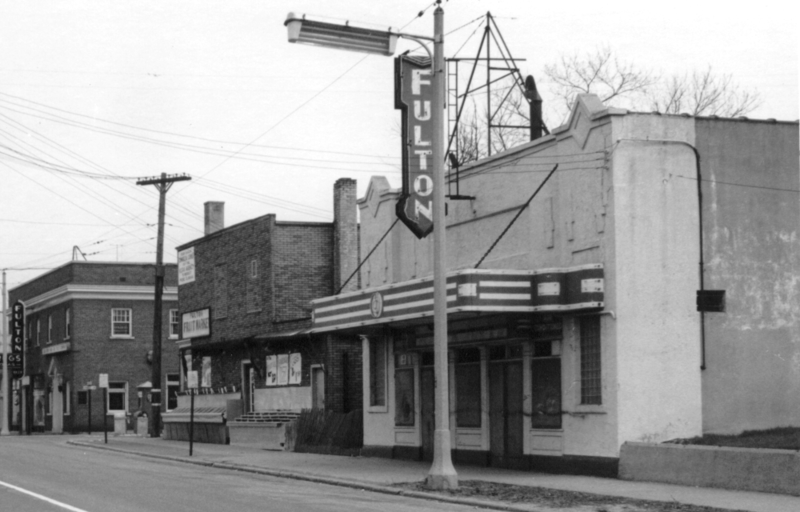 This theater first appears in the city directory in 1917 as the Fulton Vaudette, and was built on the site of the Smith Bros. Marble and Granite Works. By 1919, the listing is simply Fulton. Hollow tile theater. Owned by Leo G. Robinson, the theater was operated by Max Roszkoski. 1958 owner Mrs. E. Scheufler et al., 247 Hastings N.E. 49503. Lots 1 & 2, Block D, Shepard's Addition. Lot size 100' x 132', 13,200 square feet. Includes frame house & fruit stand at 1-7 Straight Ave., S.W. Well for air conditioning. Oil heat, hot water & hot air. Cement & wood floor. Composite & flat roof. Alley at rear. Assessed valuation $13,400, asking $47,500.